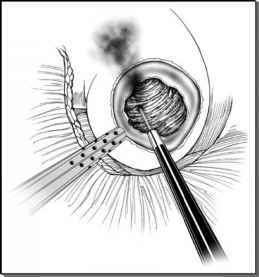 Tumor cell seeding is a major concern in laparoscopic surgery. The first reported cases of tumor seeding in urologic laparoscopy were noted after lymphadenectomy or node biopsies for bladder and prostate cancer in four and one patients, respectively. However, a specimen entrapment sac was not used in any of these initial cases (109). One of the most common sites of tumor seeding is the port where the specimen is retrieved. To date, a few cases of tumor seeding after laparoscopic renal surgery have been reported: three cases occurring after laparoscopic radical nephrectomy, and four cases after laparoscopic nephroureterectomy (61,110). Theoretically, tumor seeding during laparoscopic partial nephrectomy may occur due to high risk of tumor perforation or tumor cell spillage by contaminated instruments. In a recent survey undertaken by Micali et al. (111), 18,750 urologic laparoscopic procedures performed between 1990 and 2003 were considered, of which 10,912 were for tumor, and 555 were laparoscopic partial nephrectomies. Although the overall incidence of tumor seeding was 0.1% (13 of 10,912), no cases of tumor seeding after laparoscopic partial nephrec-tomy were noted in this study. In order to become a standard procedure for the treatment of small renal tumors, long-term follow-up tumor-free survival rates of laparoscopic partial nephrectomy should approach those of open partial nephrectomy. However, results regarding local and distant cancer control have been excellent over the short- and intermediate-term follow-up available to date. Rassweiler et al. (61) reported no evidence of recurrent disease in 100% of 37 patients undergoing laparoscopic partial nephrectomy for stage T1 renal cancer case at a mean follow-up of two years. Allaf et al. (112) evaluated oncological outcome of laparoscopic partial nephrectomy in 48 patients with pT1 (42 patients, 87.5%) or pT3a (six patients, 12.5%) renal carcinoma. Positive surgical margin rate was 2.1%. Histology demonstrated clear cell in 32 patients (67%), and papillary in 10 (21%). Laparoscopic extraction of a morcellated specimen was performed in 22.9% of cases. At a mean follow-up of 37.7 months (range, 22-84), no recurrences were noted in 95.8% of patients. Local recurrence occurred at 18 months in a patient with von Hippel-Lindau disease, and at four years in the ipsilateral kidney of a patient who underwent laparoscopic partial nephrectomy with specimen morcellation for a pT1 (2 cm) Fuhrman grade II clear cell tumor. From the oncological standpoint, these data are comparable with those after open nephron-sparing surgery.